Have you ever bought a can of candied pecans at the store, only to get home and accidentally devour all of them, and then look at the ingredient list on the can…which consequently gives you a massive stomach ache – how do you pronounce that second ingredient…but they are so good and so addictive, and you are tempted to go buy another can… After all, pecans are good for you – are they not? Does that scenario sound familiar? Can you relate? I know I can :). Luckily, I have found a solution! Maple candied pecans. They are every bit as tasty as the store-bought candied pecans, but are made with only 3 simple ingredients, and contain no refined sugar, butter, or oil. Does it get much better than that? Oh yea, they are super simple to make and cause your house to smell unbelievably delicious. These maple candied pecans are fabulous in salads, as a sweet treat, added to yogurt, or piled on top of your favorite pancake or cut-up fruit. They are also a great snack for kids. My little girl won’t eat plain nuts (she is a total stinker), but she will eat these sweetened pecans – I’ll take it. This brings to something I’ve been thinking about in my life lately – what is the balance between making something homemade and healthy vs. just buying it? Some things are faster and easier to make at home, like these pecans. But there are some things, like say, a birthday cake that I just don’t think are worth the time to make. There is no way I’m going to spend hours making a fancy cake that doesn’t even taste that good and is definitely not Clean. And the amount of work it takes to make a Clean cake and make it fancy is even way more work. And my children sure don’t appreciate the amount of work and they probably wouldn’t even like it. I don’t know. I don’t even want to try. I don’t have time. I work like all the time on this blog, when I’m not being a wife, mom or taking care of myself. What I’ve resorted to doing is buying a “normal” cake at the store for family parties, cause none of my family eats Clean and they like a store-bought cake just fine. Then on my children’s actual birthday, my husband and I take just the birthday child out to dinner and they usually get a free birthday dessert with their meal. If they don’t, we take them to get a small dessert just for them at a local bakery. That way they get a special treat and there aren’t any leftovers. Sure, it isn’t Clean, but it is a small portion, not excessive and is only on special occasions. So there’s the honest truth for you of how we balance real life treats and homemade Clean Eating treats. Cause, yes, we live in real life behind the scenes on this blog. How about you? How often do you eat Clean? 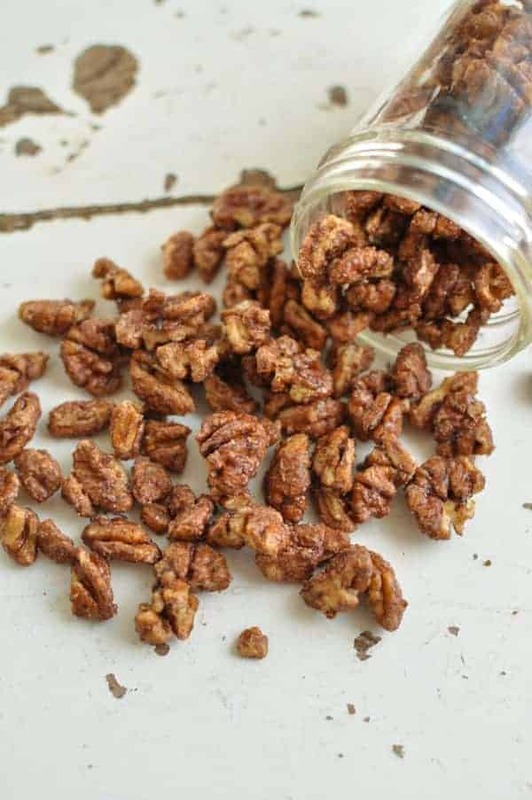 These maple candied pecans have 3 ingredients and only take 5 minutes to make on the stovetop. You’ll love the cinnamon and sweet caramelized syrup! Pure maple syrup is a must in this recipe. The results will be different with maple flavored syrup. Oh my goodness these pecans sound so delicious!! I am going to make some of these asap! Looks like your picture is actually candied walnuts…. They do look a little bit like walnuts, but they were pecans. They were fresh off of my grandma’s tree, and a little bit smaller than store bought pecans…maybe that is why :). The recipe would work with walnuts as well though. They are so good :)! these look delicious.. definitely the perfect afternoon sweet snack for when my sugar cravings hit. yum! I love them as a sugar craving snack as well!